House Democratic leaders moved forward Tuesday with plans to vote on a watered-down bill that could lead to electronic tolling on the state’s highways. Caucus leadership released details of the bill, which they hope to bring to a vote Wednesday, including a commitment to provide significant commuter-pass discount rates for Connecticut motorists. Another major change in the legislation is that, regardless of whether it is enacted this year, it would require a second, affirmative vote of the General Assembly in 2019, or later, before tolls could be established. “We’re looking at multiple in-state discounts,” said House Speaker Joe Aresimowicz, D-Berlin, who has repeatedly asserted Connecticut is foolishly failing to capture sufficient revenue from out-of-state drivers who use its highways. Tolls, the speaker has said, could both stabilize the state’s financially troubled transportation program and force those outside Connecticut to pay a greater share. The measure specifically would direct the Department of Transportation to develop a detailed plan for legislative consideration next year. Aresimowicz and other advocates have said critics have spread grossly inaccurate rumors about what a tolling system might entail. 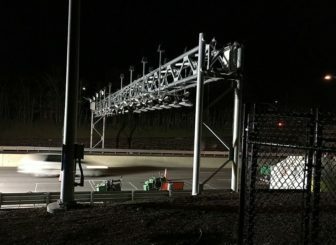 The bill stipulates the tolling plan would have to include toll gantries on Interstates 84, 91 and 95 and the Wilbur Cross and Merritt Parkways though they also could be installed on other limited access highways. Although details of the bill still could change, Aresimowicz said, plans call for a base rate of 11.8 cents per mile during peak periods and 9.4 cents off-peak. Any motorist whose license plate is registered with the state tolling system would pay rates of 9.9 cents during peak periods and 7.9 cents off peak. But Connecticut residents still would pay less. Those who buy a CT EZPass would get a 30 percent discount, which means rates of 5.5 cents on-peak and 4.4 cents off-peak. And for those who buy a special CT EZPass with a commuter rate, the cost is discounted 20 percent more, or 4.4 cents on-peak and 3.5 cents off-peak. Aresimowicz declined to speculate whether the bill would pass, but noted that, unlike past legislation, it would not implement any tolling plan without a second vote by lawmakers. A different bill recommended by the legislature’s Transportation Committee also would have directed the Department of Transportation to develop a tolling plan for legislative review in 2019. But that measure stipulated the plan would be deemed approved if lawmakers failed to act on it. This new measure includes no such default-approval process. Rep. Tony Guerrera, D-Rocky Hill, House chair of the Transportation Committee and a leading advocate of tolls, said it was the right compromise to make. Rovero said the state should consider modest increases in the gasoline tax — provided voters ratify a proposed amendment to the state Constitution on this November’s ballot. That amendment would create a “lockbox” provision stipulating that revenues raised for transportation purposes could not be diverted for other state programs. Republican legislators have been unanimous in their opposition to tolls. The GOP has countered that Connecticut must better prioritize its transportation program and borrowing in general to free up more dollars for infrastructure improvements. State transportation officials have said tolls could raise as much as $800 million per year when fully implemented, but it could take until 2022 for that to happen. The measure also would gradually increase the transfer of certain sales tax receipts to the budget’s Special Transportation Fund to stabilize its finances. The STF would receive an extra $20 million next fiscal year and more in the out years. Gov. Dannel P. Malloy has been warning since November that the Special Transportation Fund, which uses fuel taxes and transit revenue to pay debt service on borrowing for transportation projects, is headed for insolvency. Absent more funding, the state is facing scrapping some rail services, raising fares, and suspending 40 percent of planned capital projects worth about $4.3 billion in construction activity — including major highway projects such as rebuilding the Hartford viaduct, the Malloy administration says. The I-84 viaduct near Capitol Avenue in Hartford.